Many elderly have memories of serving in the military. While no one looks forward to being deployed for the sake of being deployed, these are often the memories many elderly have of their younger years. 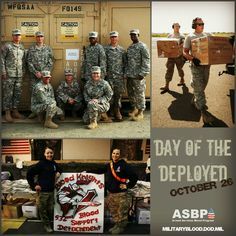 In observance of #DayOfTheDeployed – Here are couple of ideas you can do for your deployed family members and friends. Be creative . Document a regular day in photos and send them to a loved one with captions. Create care packages with baked goods, silly toys or souvenirs, newspaper articles, children’s school or artwork and video or cassette tapes of family members. Don’t avoid answering questions or write about rumors or gossip . Avoiding questions or passing along misinformation that may cause worry or fear. Try to keep communications full of news about friends, family, local events, and expressions of love.